Home > Around the Industry > Can GDPR clean up the 42% of organisations' stale data environments? Research from Veritas Technologies has revealed that despite increased scrutiny around data protection and digital privacy, 42% of companies’ total data environments are either stale (i.e. have not been modified in the last three years) or ancient (i.e. have not been modified in the last seven years). Data continues to grow at an annual rate of 49%, while the average file size has grown by 23%. With the new, elevated risks of poor data governance under the recent General Data Protection Regulation (GDPR), which grants consumers the power to request access to or removal of the personal data a company holds on them, organisations must take steps to address the issue of stale data to ensure regulatory compliance. While there has been a global effort to modernise the financial services sector, Veritas research reveals that the financial services industry is one of the worst offenders, and 20% of stale data in the sector is made up of document files. Veritas research also highlights that UK consumers are most likely to target financial services organisations, including banks and insurance companies, above any other industry sector, with personal data requests. Under GDPR, organisations are under increased pressure to handle the influx of personal data requests, which must be answered within one month of receipt of the request. 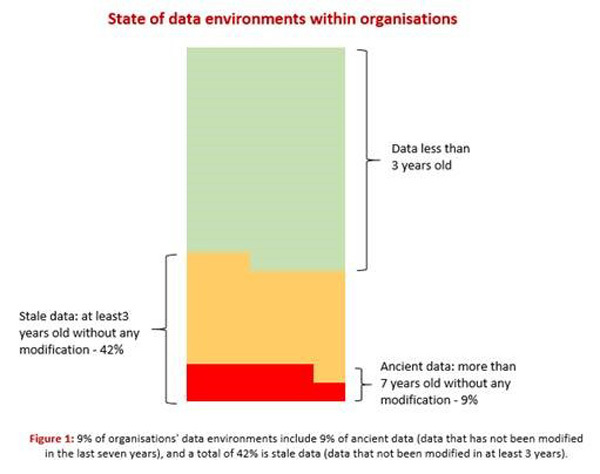 However, meeting this timeframe may be difficult as many organisations still have limited visibility into what data they have, where it is located, and whether that data still holds value. “Increased regulation in industries such as the banking and financial services sectors provide good reasons for these organisations to be early adopters of digital technologies,” said Jason Tooley, Vice President Northern Europe at Veritas Technologies. “Regulatory compliance aside, as consumers demand more transparency and accountability from businesses, we are seeing a ‘new norm’ in which consumers intend to reward organisations that properly protect their personal data, and punish those that don’t by shopping elsewhere or attacking brand reputations. Stale data creates an unnecessary risk that can significantly damage reputation, brand loyalty and the bottom line,” concluded Tooley.